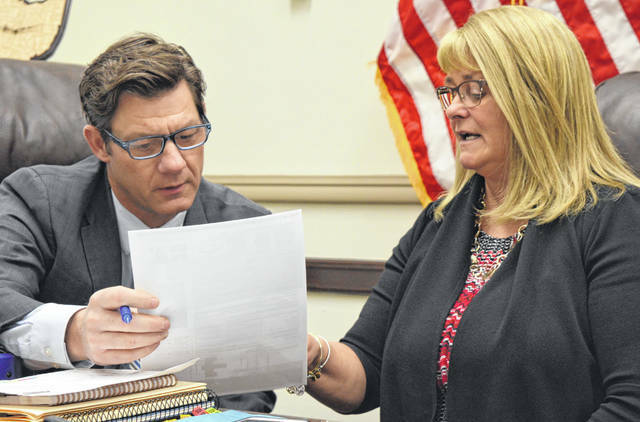 From left, Clinton County Commissioner Kerry R. Steed and Clinton County Commissioners President Brenda K. Woods find a paper useful as they conduct county business this week. 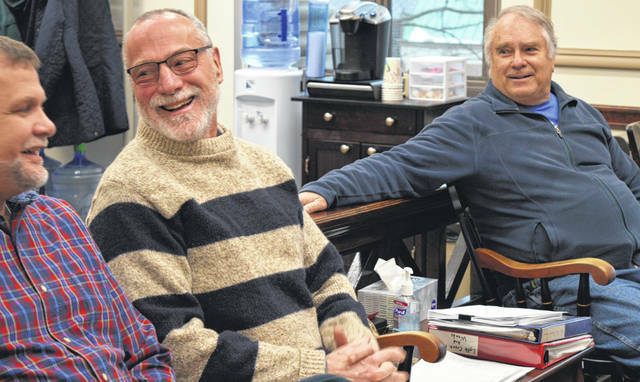 Clinton County Park District’s new board member Jeff Drapalik, center, came for an appointment with county commissioners, along with Clinton County Auditor Terence “Terry” G. Habermehl, left, and Clinton County Park District board member Bob Thobaben, right. WILMINGTON — AT&T could be interested in leasing an area on the Clinton County Fairgrounds for a cell tower. A site acquisition agent contacted the county commissioners office inquiring whether commissioners would entertain leasing ground to AT&T. The Board of Commissioners of Clinton County owns the land in question, which reportedly is located behind the hog barn. Though the county owns the land, commissioners want to know what the Clinton County Fair Board thinks of the idea, and so Clinton County Administrator Mary Ann Haines Foland will reach out to Fair Board President Scot Gerber. During discussion at Wednesday’s commissioners session, Clinton County Commissioner Kerry R. Steed said cell tower leasing can be a revenue generator. He believes the industry average is between $1,500 and $1,800 per month. According to basic information the acquisition agent submitted to commissioners, the lease area could be as small as 70 feet by 70 feet, “but ideally it would be 100 feet by 100 feet.” The tower would be 200 feet or less in height, and the compound and equipment would be inside a locked barbed-wire chain-link fence. The site would be reviewed by radio frequency engineers for its suitability before AT&T would pursue a lease. A City of Wilmington water tower is already located on the fairgrounds. On another matter, commissioners on Wednesday voted to buy a NUCTECH body scanner for the Clinton County Jail. A body scanner is utilized to detect drugs that are being smuggled into a detention facility in a person’s body cavities. The body scanner price is $125,000. To help defray the cost, the county will utilize grants from the local not-for-profit HealthFirst For Clinton County and from the County Risk Sharing Authority (CORSA) which provides its Ohio members with property and liability coverage and risk management services. During discussion time, Clinton County Commissioner Michael “Mike” McCarty said he attended a regional workforce development meeting in Hillsboro where a representative of a state agency spoke about work opportunity tax credits for hiring people of certain demographics at all sizes of businesses. Those demographics include, for example, people with a felony on their record, and people with disabilities. In addition to the tax credits, there’s a federal bonding program through the Ohio Department of Rehabilitation and Corrections to help employers with risk mitigation for felons re-entering the workforce, McCarty said. A former small business owner, McCarty said he was not aware of a lot of the programs discussed at the workforce development meeting. Commissioners this week were introduced to new Clinton County Park District board member Jeff Drapalik. Drapalik said he sees parks as a real asset to the community, and he would like to leverage the current county park properties. Among those are the Wallace Collett Nature Preserve, the Anliot-Davidson Woods, the Dr. Nathan Hale Memorial Woods, East Fork Riparian Reserve, the Lytle Creek Prairie and Woods, the Clinton-Fayette Friendship Trail, and the Terrell Preserve. The three Park District board members are Bob Johnson, Bob Thobaben and Drapalik.